AUGUSTA, Ga. -- Standing behind the 18th green at Augusta National -- with a row of 20 patrons in front of me about 40 more to my rear, it was easy to get lost in the moment and become unaware of one's surroundings. Usually when we experience historic moments at sporting events, we are in the stands, platformed one row behind each other with a clear view of the action. When the bogey putt dropped on his 72nd hole and Tiger Woods raised his fists to scream to the heavens, I saw the top of a black Nike hat, the red collar of his mock-neck shirt and a putter shot into the air ... along with the simultaneous pumping fist motion made by the thousands around me. I generalize that number as "thousands" because even watching the four-minute celebration back, it's impossible to fathom how many spectators surrounded the 18th fairway, 18th green and Woods' path back to the clubhouse to submit his scorecard. I've never seen anything like it in sports. Not when Woods had the masses flank him during his walk to the 18th green on his way to winning the Tour Championship at East Lake. Not when football clubs across the globe celebrate their trophy presentations in the stands. Not when fans rush the court after a buzzer-beater or storm the field following an upset victory. It was the most peaceful pandemonium one could imagine. And while it was an unreal experience, cultivating long-dormant emotions usually withheld for personal moments, watching the scene unfold from the birds-eye view of our CBS cameras the morning after not just nourished those emotions but somehow enhanced them. Over a span of 4:03, Woods first sinks his final putt, officially completing the redemption story of a man who has seemingly transitioned from a win-at-all-costs egoist to a grind-it-out altruist. That's not to say winning is no longer foremost in his mind, it's just that he now knows there's much more that matters in life, a realization we all encounter at some point. With fans roaring in every direction and chanting his name so loud it likely could have been heard in Atlanta, Woods received congratulations from his playing partners and caddie Joe LaCava. He then turned to his family, waiting for him behind the 18th green. In a moment that will replay on sports reels forever, Woods bear-hugged his son Charlie with the same vigor with which he once grabbed his father Earl after Tiger's first Masters win 22 years prior. Hugs with no less power were then delivered to his mother Kultida and daughter Sam before Tiger made a trek through a sea of patrons that gathered to exalt him. Far away in the background, perhaps drowned in the water at No. 12 along with Francesco Molinari's ball, were the justified criticisms of his personal life, the strain his playing style took on his body for so many years, and the numerous surgeries on his back and neck that saw Woods miss eight straight majors (2016-17) altogether and get cut at four of the six he played in the two years prior (2014-15). In that moment, Woods became again what he never actually stopped being -- a man of the people. The man of the people. The first golfer since Jack Nicklaus to be bigger than the sport, who like Jack is the second to go more than 20 years between major championship victories. As Tiger's red mock shirt parted the sea of patrons, there were more guttural screams and fist pumps. Outstretched arms of the spectators begged for a connection with Woods, and he indulged a few. Then he made the turn toward the clubhouse where one would expect the number of waiting patrons to dissipate. Nope. Through a second tunnel Woods went with a grin on his face that told a simple story: This means as much to me as it does to you. Again, experiencing all of this in the moment, feet firmly planted without elevation, it was tough to soak it all in. But take 4:03 out of your life -- as I did this morning -- and watch it again. Feel the feels. 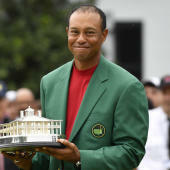 Tiger Woods is your 2019 Masters champion, and in winning his fifth green jacket, he brought a renewed sense of relief to himself, likely his family, and surely sports fans across the globe who love cheering for champions but will always prefer a great redemption story.